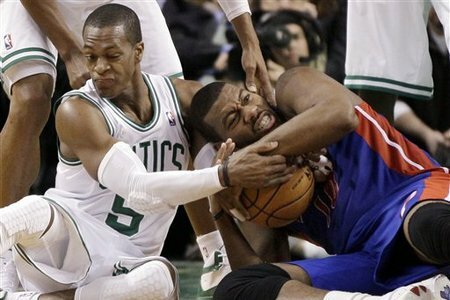 The Celtics look for revenge against the pistons today at 6:00 in Detroit. The Pistons won the last game Wednesday 98-88. Detroit is on a hot stretch as they won 6 of their last 8 after starting the season 4-20. The Celtics are now 15-14 on the season as they look to rebound from losses to the Bulls and Pistons. This season the Celts are 4-6 on the road and the Pistons are 7-10 at home. Rondo cooled off a little after two straight games of +30 points, he had 17against the Bulls. Kevin Garnett had 18 and 10 in his first game back from a hip flexor. The Pistons are coming off of a win against the Kings where they were paced by Rodney Stuckey’s 36 points. Brandon Knight their rookie had a double-double with 23 points and 10 assists. The Celtics have to make sure that they find Ben Gordon after he went 4-6 from 3 in the 4th quarter the last time they played. According to Synergy Sports, the Celtics have the 3rd rank defense and the 9th ranked offense. The Pistons have the 29th ranked defense and the 27th ranked offense. The Celtics should look to use their advantage off of screens to Ray Allen and even Mickael Pietrus. The Pistons rank 27th in defending screens. The Pistons are also the 30th best team in the NBA at defending isolations. The Celtics should look to spread and let Paul and Rondo have a little one-on-one fun. This entry was posted in Celtics and tagged Ben Gordon, boston sports blog, celtics, kevin garnett, kg, pistons, rajon rondo, Synergy Sports by leibo4. Bookmark the permalink. KG out tonight due to personal reasons.